Early this week, Minister of Posts Jeewan Kuarathunge declared that we can now design and print our own stamps to be used in snail mails/posts, thereby quietly opening a new chapter in the postal services and more importantly, new doors for the stamp enthusiast. 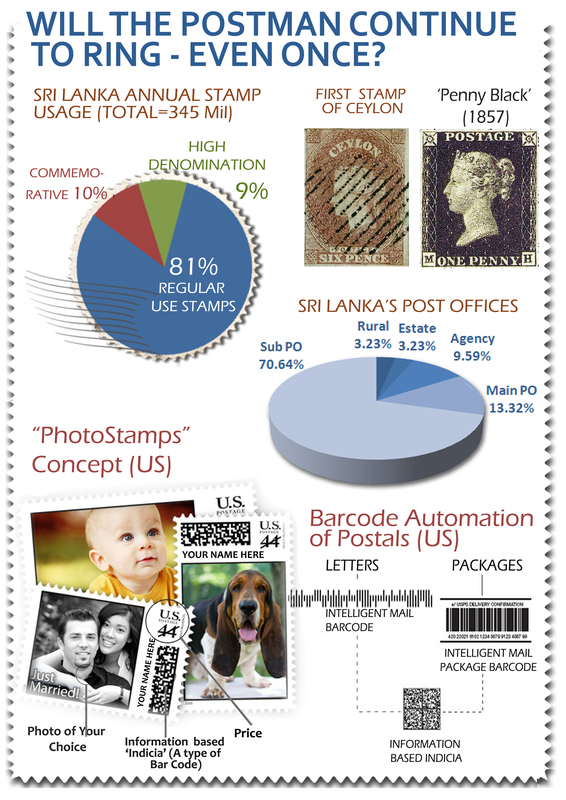 Before elaborating on this further, let’s briefly scan Sri Lanka’s Stamp & Postal history. According to the Postal Department, Sri Lanka is the first to inaugurate a mail coach service in all of Asia-between Colombo & Kandy in 1832 followed by Colombo-Galle in 1838. The Central Bank reports say that 70% of our post offices are sub post offices-our postal service consists of 4,738 post offices, of which 643 are main post offices, 3,411 sub post offices, 463 agency post offices, 156 rural agency postal offices and 156 estate post offices- in practice, this translates to a post office for every 14 km radius. The mail use is 21 letters per inhabitant but the Postal Services continue to make huge losses-Rs 2.1 billion losses in 2008 and 2.4 billion in 2009! The first stamps for ‘Ceylon’ were issued on 1 April 1857-just 17 years after world’s first adhesive postage stamp ‘Penny Black’ was issued in Britain in 1840- while the first ‘Sri Lanka’ stamps came out in May 1972. The 1857’s first stamp was a purple-brown ‘imperforate’ which “Stanley Gibbons Catalogue” (the world leader in stamp collections) values at £7500 for an unused stamp (Rs. 1.33 mil). The annual demand for stamps is 345 million with stamp values ranging from 50 cents and to 1,000 rupees. The cost to print a stamp is Rs. 1.25. Among the 345 million stamps are 30 million high denomination stamps and 35 million commemorative stamps. Since 1857, countless number of stamps has been issued by the Postal Department of Sri Lanka. Sri Lanka Post now employs more than 19000.
Who is the culprit responsible for decline in our postal services? We tend to think that the main contributor for our postal services to go out of fashion is due to the rapid advances in mobile telephony and the internet in Sri Lanka-or even in US. However, recent news reports do not hold on to this belief. According to these news reports, an interesting reason for the decline in use of snail mails in the US postal services is not mere emergence of web/emails and mobile sms gateways-the key culprit being the commercial Banks! In that, the Banks have increasingly switching to electronic payment systems instead of printed paper bills for all their utility bills, and this ‘switch’ has resulted in a steady decline of snail mails. For instance, the US postal service which has been using ‘bar codes’ for postal automation, has now introduced ‘Intelligent Mail’ (2009). The Intelligent Mail Bar Code (IMBC) will not only allow normal mails to be tracked just as we track DHL, UPS parcels, but also holds sender’s full contact info so that if there is an issue with regard to routing / delivery of the mail, the sender is notified immediately of ‘a possible delay’ and in case of an improper or undesirable package, the sender can be identified and be held responsible. “Click ‘n’ Ship” is the other innovation by the US Postal Service. In “Click ‘n’ Ship”, the Web is leveraged. Using the net, the customer can find their postal rates, print out postage and even schedule a free pickup without ever having to stand in a queue of post office counter! ‘Automated Postal Centers’ are the recently introduced mini kiosks that do many automated actions for consumers -dispense stamps, issue ‘registered’ mail receipts etc- so that the they do not have to stand in postal counter queues. Last but not least, the self issuable stamps in US- in that, the Stamps.com site prints citizen’s own commemorative stamps! By this, the US Postal Service is testing out its PhotoStamps concept, which lets consumers put their own ‘cute pictures’ on commemorative-size stamps by uploading their own choice of a photo to the stamps.com site (US only) and they can generate stamps designed by themselves-it is this “PhotoStamps” concept that our Minister of Posts was emphasizing early this week! What is interesting is the technology adoption feasibility in Sri Lanka-none of the above mentioned new techs in US are ‘so costly’ for us-Sri Lanka is already connected to strong SEA-ME-WE internet backbone and everyone knows of the rapid developments in our IT and Telecom sectors, and thus, new technology adoption requirements are lesser. Neither the above mentioned new techs are costly by themselves-they mostly leverage the already existing power of the Web and in addition, demand a mere digital camera, which again is no such hassle. Sri Lanka Post will not face its challenge in these areas. It’s real challenges however are likely from an entirely different direction—the Banks, electronic payment gateways and more importantly, public perception arena—in that, the acute image issue-the perception among the general public that ‘the Postal Services are now taking a backseat’ which is especially prevalent among the urban population demographics. If SL Post gears up and takes them with relevant strategies, soon the public can hear the postmen ringing again (perhaps digitally). And more importantly, SL Post could turn the billion rupee losses in to something more positive and thus, will be able to ring up its own curtain as well!